The 2016 Hawaii Democratic caucuses were held on March 26 in the U.S. state of Hawaii as one of the Democratic Party's statewide nomination contests ahead of the 2016 presidential election. 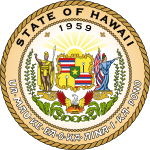 While the State of Hawaii's primary for the 2016 Senate and House elections are scheduled to be held only on August 13,  both the Democratic Party and the Republican Party opted out to hold their own caucuses. With the Republican caucus having taken place earlier in March, the Republican Party did not hold any caucuses on March 26, while the Democratic Party held concurrent caucuses in Alaska and in Washington state. The Democratic Presidential Preference Poll (PPP) was a separate event from the caucus although held on the same day as the caucus. Voters needed to show that they were registered Democrats (they could register on the day of voting) and that they lived in the precinct where they voted (a driver's license or an electric bill was sufficient). Once these conditions were met, they were handed a paper ballot to fill in and deposit in the ballot box. When there were no more voters, the PPP was closed. The precinct officers publicly hand counted the ballots, recorded them, then sealed them in an envelope that was delivered to the District Officers, then to the County Officers, and finally the State Office where they were counted again. The Results displayed here are from the PPP. The caucus was held immediately after these events but had no role in selection of the Presidential candidate. Hawaii superdelegates were not bound by the PPP results. Eight of ten superdelegates chose to ignore the PPP vote. Sanders received one of his largest wins in Hawaii, carrying all four counties and every island in the state. He was aided by his high-profile endorsement from Democratic Congresswoman Tulsi Gabbard, who ran ads for Sanders encouraging people to caucus for him. Sanders' worst performance was in Oahu which contains the capital city of Honolulu, where he received 63% of the vote. Sanders's victory in Hawaii showed that he could win convincingly in a state where the electorate is majority non-white (in Hawaii it is significantly Asian and Pacific Islander). ^ "Proclamation" (PDF). State of Hawaii Office of Elections. 26 January 2016. Retrieved 28 March 2016. ^ "Western caucuses primed for Sanders". Retrieved 2016-09-25. ^ Chozick, Amy (2016-03-26). "Bernie Sanders Seizes 3 States, Sweeping Democratic Contests". The New York Times. ISSN 0362-4331. Retrieved 2016-08-07.